First, Haley's comment "We're feeling a crushing national debt" denies the fact that during the seven years Obama has been in office, the deficit as a percentage of GDP has dropped dramatically from the deficit he inherited for Pres G.W. Bush. The following table gives the years years 2009 through 2014, according to historical data maintained by the Office of Management and Budget, and the 2015 figure is the most recent estimate by the nonpartisan Congressional Budget Office, released in August 2015. Our Republican friends are again trying to drive the narrative with pretend facts. While Democrats allow Republicans to control the political narrative, they will control Congress, the Senate and the Presidency, and re-implement the failed policies that led to the 2008 Great Recession. 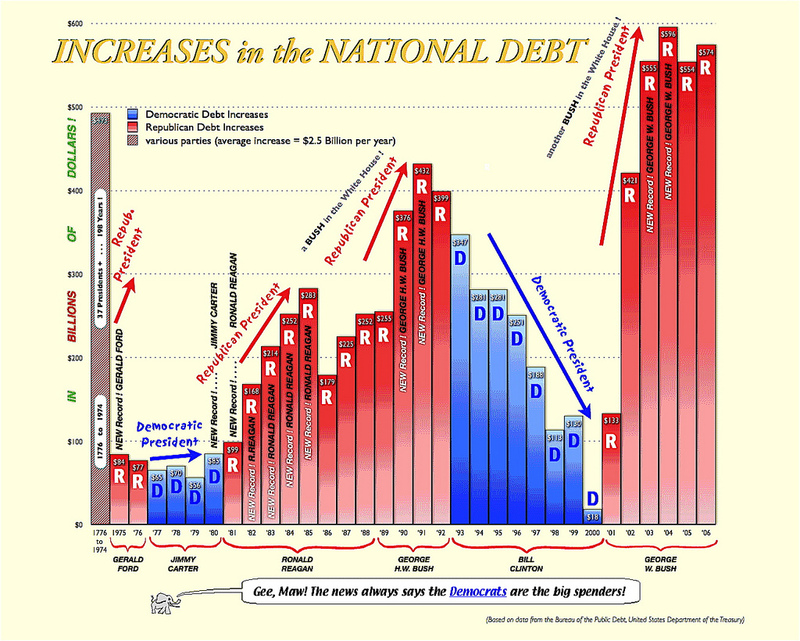 To refute the Republican attempt to rewrite history - to reconstituted failed conservative governing ideology - lets look a few more graphs developed from the Budget of the United States Government: Historical Tables - Fiscal Year 2015. First let’s look at who added substantially to the budget deficit, while repeatedly cutting taxes for the wealthiest living in this country. Note: President Clinton’s last budget posted a $128 billion surplus. 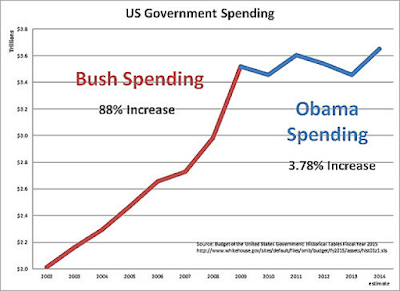 Who created more debt – Bush or Obama? 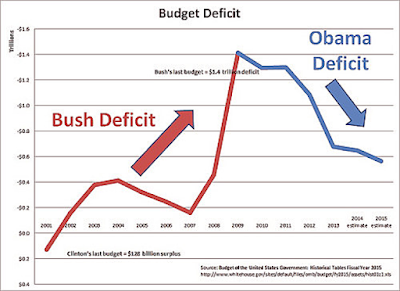 President Obama inherited a budget deficit of $1.4 trillion from President Bush's last budget year and annual budget deficits have gone down dramatically since. Extending the deficit picture back over administrations of the last six presidents preceding Pres. Obama, we see administrations of Democratic Presidents reduce large deficits created by the previous Republican president. Next, let’s look at spending, the second attempt to rewrite history. The numbers in the charts above are just the amounts the government spent and borrowed, period, Anyone can go look them up. People who claim that Obama "tripled the deficit" or increased it, or anything of the sort, are either misled or are trying to mislead. 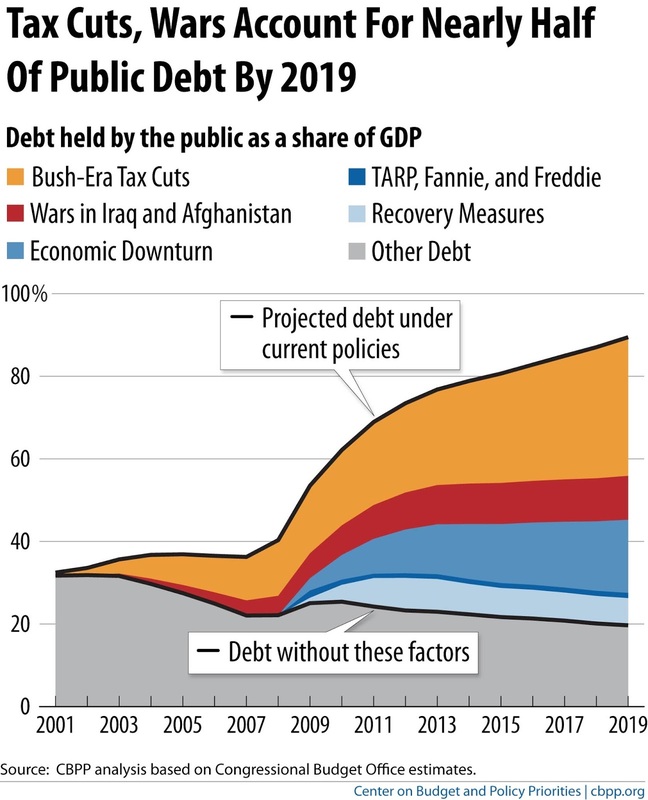 And then, there is the repeated debt limit crisis rhetoric during Obama's seven years in office. The Republican Party demanded that the President negotiate over reducing the deficit built up during Pres. 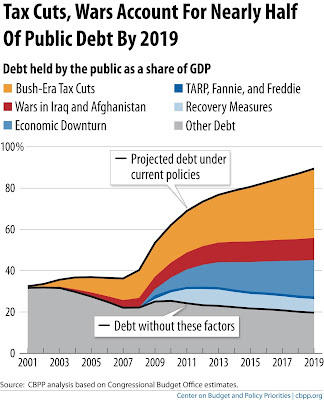 Bush's administration, in exchange for an increase in the debt ceiling. The 2011 debt limit crisis created by Republicans in congress sparked the most volatile week for financial markets since the 2008 market. The stock market trended significantly downward. Later that week Standard and Poor’s downgraded the credit rating of the United States Government for the first time in our country’s history. The Government Accounting Office estimated that the delay in raising the debt ceiling increased government borrowing costs by $1.3 billion in 2011. We also had a 16 day partial shutdown of government as a result of the crisis. But why did Republicans suddenly get religion against raising the debt limit while Pres. 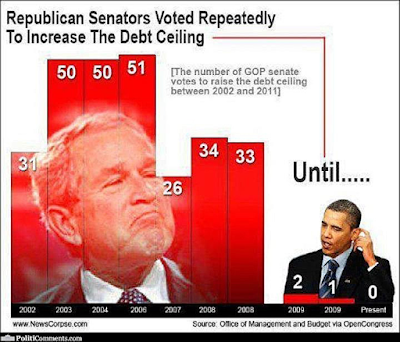 Obama was in the White House, after Republicans repeatedly raised the debt limit whenever Pres. Bush ask Congress to raise that limit number. See the diagram. Haley asserted: “Democrats in Washington bear much responsibility for the problems facing America today,” like unemployment.But it was Pres. Bush's aided but a Republican controlled congress that caused massive job losses by Bush's last year in the White House. By the end of Pres. Bush's 8 year term of office in January 2009, the U.S. was on the brink of economic disaster as a result of the poor fiscal policy decisions and Wall Street banking industry deregulation under the Bush Administration. The auto industry had to be rescued, Wall Street had to be bailed out, the Trickle Down did not work, and increasing numbers of working class Americans were out of a job and being foreclosed out of their homes. Republicans created those problems; Democrats had to over come those on-the-brink-of-disaster problems. The pace of monthly job losses slowed dramatically soon after President Obama took office in January 2009 after Congress enacted Pres. Obama's Recovery Act in February 2009. That economic stimulus package was far small than Obama requested, but conservatives in Congress would allow only minimal stimulus spending - after spending like drunken sailors while repeated cutting taxes for the richest Americans during Pres, Bush's 8 years in office. 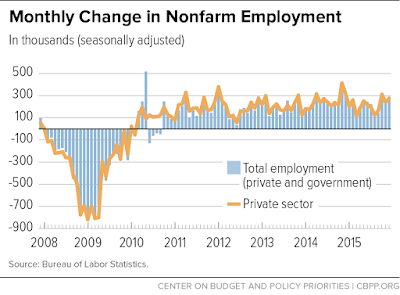 The stimulus did begin to kick in slowly but the trend in job growth in 2010 was obscured by the rapid ramp-up and subsequent decline in government hiring for the 2010 Census, but private employers have added 14.1 million jobs to their payrolls in the 70 months since February 2010, an average of 201,000 jobs a month. Total employment (private plus government) has averaged 194,000 over that period, as federal, state, and especially local government were net job losers. 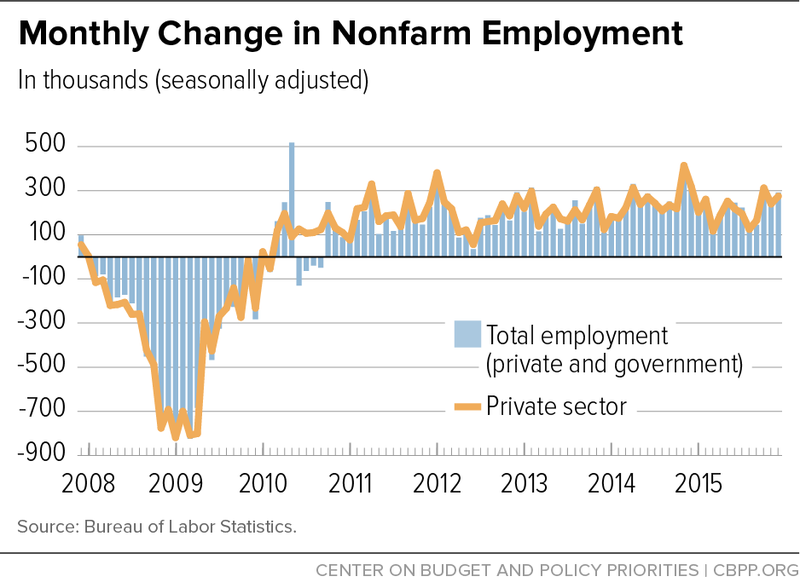 In December, private employers added 275,000 jobs, federal government employment rose by 4,000, state government employment by 6,000, and local government employment by 7,000. While job growth has returned since the 2008-09 great shedding of American jobs, it has in deed been a no-raises recovery. 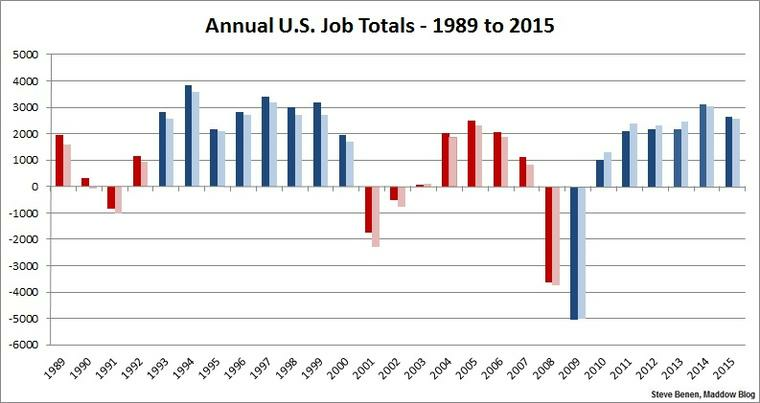 The chart below shows what happened to jobs under the policies of Bush and the Republicans. We were losing lots and lots of jobs - 8,50,000 every month - and it was getting worse and worse. After Pres Obama took office we stopped losing jobs and started gaining jobs, and it was getting better and better. The leveling off on the right side of the chart shows what happened under progressive policies of governance - the nation moved from losing around 850,000 jobs a month to gaining over 200,000 jobs a month. The upper one percent continued to see increases in their income while the rest of us saw little in the way of wage increases or wealth creation. In deed, after repeated tax cuts for the wealthy and other structural changes made the American economic system while Republicans and conservative "moderate" Democrats controlled congress and the White House, middle class Americans are seeing wealth steadily decline. In fact, the top 10 percent of earners take home half the income of the country; in 2012, the top 1 percent earned more than a fifth of U.S. income – the highest share since the government began collecting the data a century ago. The economic boom on Wall Street and in corporate executive compensation have poured money into the pocketbooks of the already wealthy, but it has done almost nothing to boost paychecks for typical American workers. Meager improvements since 2009 have barely kept up with a similarly tepid pace of inflation, raising the real value of compensation per hour by only 0.5 percent. That marks the weakest growth since World War II, with increases averaging 9.2 percent at a similar point in past expansions, according to Bureau of Labor Statistics data compiled by Bloomberg. Since 1979 the one percent saw a 138% increase in their wages while the rest of us saw a 15% increase in our wages. Republicans only give lip service to supporting the middle class. While America may be creating jobs, it isn't creating many well paying jobs - and American workers are increasingly angry about their stagnate paycheck! This is a much more critical political issue than most in the Democratic Party's leadership ranks understand or are willing to address with meaningful policy ideas. It likely explains to large extent why Sen. Bernie Sander's campaign message on income inequality is increasingly gaining traction, as more voters hear his message. More than half of Americans — 56 percent, to be exact — have less than $1,000 combined in their checking and savings accounts, according to a recent survey, Forbes reported. This is to say, most Americans are living paycheck-to-paycheck. Furthermore, almost two-thirds of Americans — 63 percent — do not have enough in their savings for an emergency. A substantial majority of Americans would need to borrow money if faced with an unexpected expense. Compared to other industrialized nations, the U.S. now has grossly disproportionate poverty rates. The U.S. may be the most powerful country in the world, economically and militarily speaking, but if this does not bring with it a high standard of living or ensure well-being - health care, education, living wage jobs, etc. - for citizens, it ultimately does not matter; it simply benefits the rich, and the rich alone. GOP Presidential candidate Donald Trump in his promise to "Make America Great Again" is likely tapping anger over their stagnate paychecks and voters translate his claim he will "make America great again" as he will recreate an America where workers can earn a living wage. 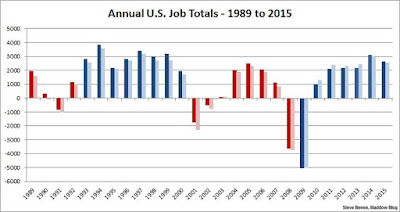 The "1989- 2015 Job Totals" graph above clearly shows American business create jobs when Democrats hold the White House and shed jobs while Republicans occupy the White House. The above are just the false things everyone commonly "knows" because conservative information outlets like Fox News repeat them over and over and over. Some others are (click through): Obama bailed out the banks, businesses will hire if they get tax cuts, health care reform cost $1 trillion, Social Security is a Ponzi Scheme or is "going broke", tax cuts grow the economy, government spending "takes money out of the economy." Government spending is literally, by definition, the things that government does to make our lives better. 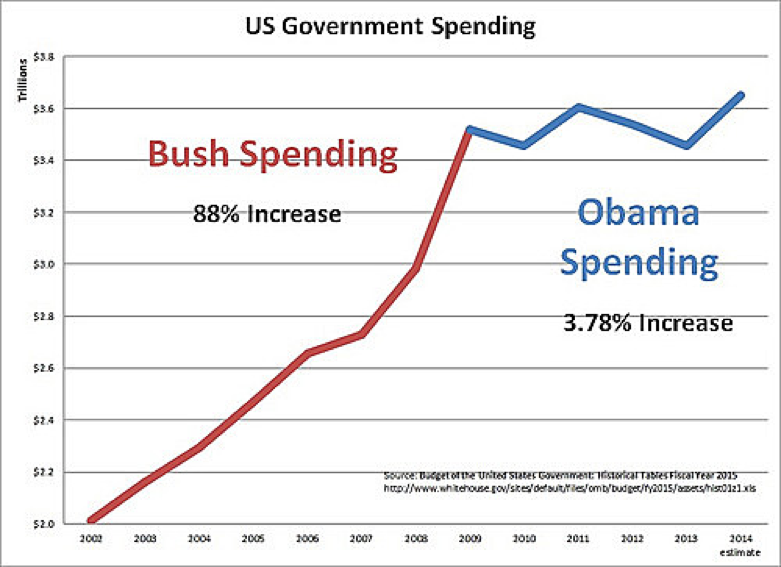 People have been tricked into thinking that government spending is somehow bad. The billionaires and giant corporations spread this nonsense around because they are greedy and just want their taxes lower. The top income tax rate used to be more than 90 percent and the top corporate tax rate used to be more than 50 percent. That was back when we built this country's great infrastructure, had good schools and defended the world against the Soviet Union. We also had higher economic growth and a growing middle class. 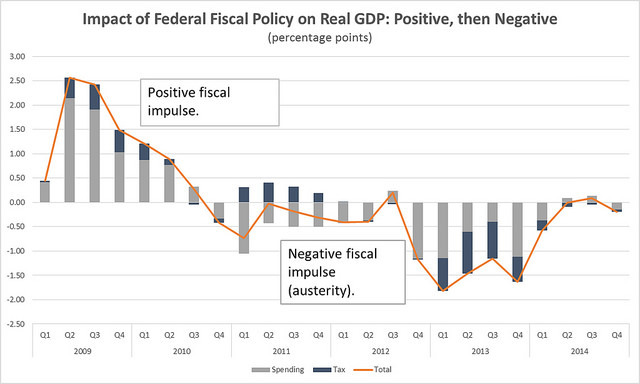 Government spending does not "take money out of the economy." In fact, it puts money into the economy, creates jobs and lays the foundation for future prosperity. The decline in government spending shown in the charts above is the reason that the economy remains sluggish and jobs are still hard to get. Just look at that chart showing what the stimulus spending did for the job situation. But since the stimulus ended, Republicans have obstructed every effort to continue to use our government to help our economy. 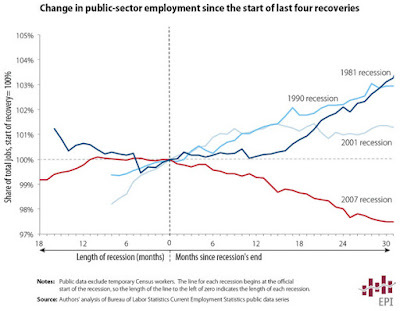 For example, this chart from The Atlantic, "The Incredible Shrinking U.S. Government," shows how government spending to create government jobs helped us get out of the 1981, 1990 and 2001 recessions. But since the 2007 "Great Recession," we instead have laid off hundreds of thousands of government employees, obviously making unemployment even worse. 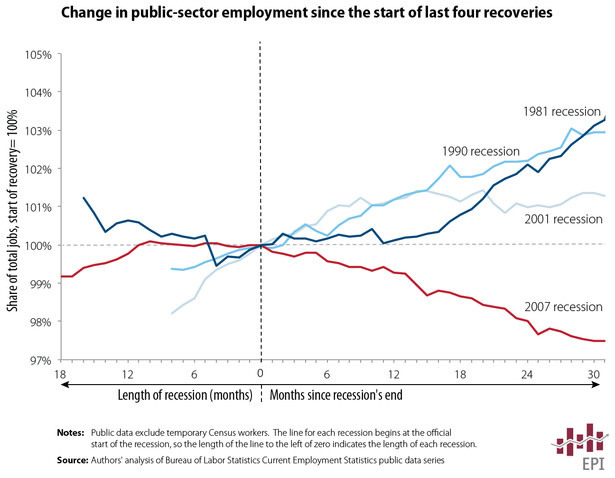 This chart shows only the loss of government jobs. Never mind the job losses in the stores where all of these people were shopping. The Atlantic article says this, "EPI argues that "these extra government jobs would have helped preserve about 500,000 private sector jobs." And never mind the millions of jobs lost or not created because of "austerity" cutbacks in government spending on things like maintaining (never mind modernizing) our infrastructure! And beyond that, what if we had spent some money (public investment) to retrofit every building and home in the country to be energy efficient, or built high-speed rail around the country? How many millions more would have been hired to do those things -- and how much would we be saving on energy and other costs from now on? 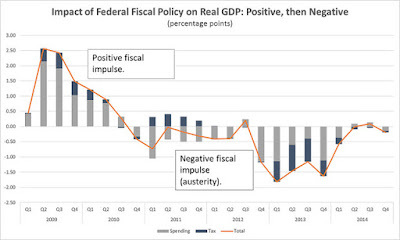 "As you can see, the impact of austerity on the economy declined in the last two quarters of 2014, but the following budget was not expected to be expansionary - due to the mistaken conservative Republican theory that spending cuts somehow stimulate growth." Republicans like to say government is like a family budget -- when the money isn't coming in you have to cut back. That's just nonsense if you think about it. First of all, if we make the big corporations and billionaires pay their fair share of taxes again, the money would be coming in. And anyway, families do invest in a mortgage, student loans and car loans so they can have a place to live, a good education to get a better job, and a car to get to and from work. So don't fall for the nonsense the big corporations and billionaires are spreading through their right-wing outlets. When you look a little deeper, that stuff just falls apart. A country needs to invest to create jobs and have a better future. These things really matter. We all want to fix the terrible problems the country has. But it is so important to know just what the problems are before you decide how to fix them. Otherwise the things you do to try to solve those problems might just make them worse -- just as laying off government workers in a recession makes unemployment worse. If we get tricked into thinking that Obama has made things worse and that we should go back to what we were doing before Obama -- tax cuts for the rich, giving giant corporations and Wall Street everything they want, when those are the things that caused the problems in the first place -- then we will be in real trouble. All the problems Republicans complain about been caused by Republican governing policies. Republicans have stubbornly imposed ultra-conservative governance ideology on the congressional legislative process to block President Obama's efforts to enact legislation that would allow American workers to share more of the wealth generated in the still recovering economy. So when Gov. Haley says. "Unfortunately, the President's record has often fallen far short of his soaring words ... [while] many Americans are still feeling the squeeze of an economy too weak to raise income levels," she has only the Republican's documented goal to turn Pres. Obama into a failed president to blame. GOP Speaker of the House Paul Ryan struggles to explain Obama-era economy, after Obama's SOTU address. On wealth inequality, polls find that “a strong majority” of U.S. citizens believe the current situation is an urgent problem (including one-half of Republicans and two-thirds of independents), and think the current income and wealth distribution is unfair. Despite Republican fear-mongering about big government, Americans “favor taxing the wealthy to expand aid to the poor,” and want Congress to rectify this inequality by levying “heavy taxes on [the] rich” and increasing rates on people making over $1 million a year. Americans also support steep progressive reform on Wall Street, with 50% to 58% of likely voters in favor of breaking up the big financial institutions. Concerning the infusion of money in politics, Americans want campaign finance reform “with near unanimity,” and half would personally vote for a law establishing the government funding of federal campaigns. The support for reform is strong across party lines, with a prodigious 80% of Republicans, 84% of Independents, and 90% of Democrats believing money plays too large a role in the political process. Other polls show three in four Americans think there is too much money in politics and disagree with the concept of unregulated campaign finance. Americans also support a substantial raise for low-wage workers, with 63% in favor of a $15 minimum wage by 2020, and 75% in favor of $12.50 by the same year. Other polls show that a majority of swing-state Republican voters support an increase, and 69% of working people favor an increase to $15. Concerning workers’ rights, a majority also want to improve scheduling for chain-store and fast-food restaurant employees. On the power of money and big business in general, 75% of Americans think large corporations have too much influence in the country. With top CEOs making 373 times what their workers do, Americans think the government should take action to narrow the gap: one-third of Republicans want to cap the income of corporate executives, and 59% of Americans support government restriction of CEO pay. Likewise, there is very strong support for universal health care. Just over 50% of Americans support a single-payer system, and 65% of voters think every American should have access to quality healthcare. Most Americans would be willing to pay higher taxes so everyone could have care, and put more faith in the government’s ability to hold down health-care costs than the private sector’s. 58% of Americans support a Medicare-for-all system, and a majority of Americans think the government should ensure coverage. A majority of voters in Republican states support Medicaid expansion as well, as do 56% of Virginians, including 55% of Republicans. A majority of Americans also support Social Security, with 65% of Americans in favor of its expansion. Haley has come under withering criticism from right-wing conservatives displeased with Haley for "piling-on the GOP candidates," after President Obama devoted significant portions of his final address chastising the brand of racism and xenophobia practices by Trump and other GOP candidates. Conservatives voices like commentator Ann Coulter’s demanded Haley, the GOP daughter of Indian immigrants, be deported. Transcript of Nikki Haley's Republican response to the 2016 State of the Union address. As prepared for delivery.